We have noticed that Drawing and disbursing officers (DDO) /Employers are generally not entertaining the claim of employee regarding payment of Tuition fees for full time education of their children as a whole under section 80C. They are allowing only the the fees which has been shown as with title "Tuition fees " in fees receipt issued by educational institutes . Admission fees , Computer fee , Science Class fees ,Practical fees , Exam fees etc are not being allowed. In most of the cases even after employees raises the query to DDO that why he has dis qualified the of other type of fees for the purpose of section 80C ?, The queries are not being properly addressed . Moreover in few cases DDO raised a cross question where it is written that all type of fees are allowed ?. (c) for the purposes of clause (xvii) of that subsection, in the case of an individual, any two children of such individual. Schools ,colleges are generally charged various type of fees from student like admission fees , practical fees , exam fees , computer class fees, building fund and tuition fees . The "Tuition fees " word used in School/ colleges and used in section 80C has different meaning and Later have wider meaning/scope. The example of above are Building Fund,development fees,Capitation Fund etc. So all other type of fees are allowed and eligible under section 80C and should also be allowed by DDO's. This issue has been again clarified through circular 1/2017 dated 02.01.2017 (How to Calculate TDS on salary Income) .Relevant part of circular 1/2017 has been reproduced here under. Tuition fees, whether at the time of admission or thereafter, paid to any university, college, school or other educational institution situated in India, for the purpose of full-time education of any two children of the employee. Full-time education includes any educational course offered by any university, college, school or other educational institution to a student who is enrolled full-time for the said course. It is also clarified that full-time education includes play-school activities, pre nursery and nursery classes. It is clarified that the amount allowable as tuition fees shall include any payment of fee to any university, college, school or other educational institution in India except the amount representing payment in the nature of development fees or donation or capitation fees or payment of similar nature. In the above circular it has been clarified that "tuition fees shall include any payment of fees " "except the amount representing payment in the nature of development fees or donation or capitation fees or payment of similar nature. " Further CBDT also clarified that full-time education includes play-school activities, pre nursery and nursery classes. From the above we can summarise the provisions related to deduction of tuition fees payment under section 80C as under. Tuition Fees deduction is allowed under section 80C of the Income Tax Act. The overall limit of 1,50,000 is applicable of section 80C ,80CCD(2) ,80CCC for Fy 2016-17 . The tuition fees under section 80C has broader meaning then generally prevails in society as explained above . 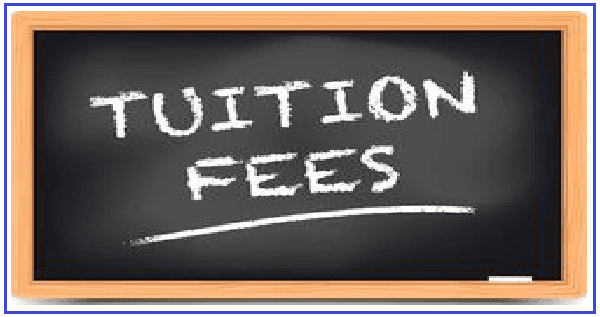 Tuition fees does not include the amount representing payment in the nature of development fees or donation or capitation fees or payment of similar nature . Tuition fees deduction allowed for "any two child" of individual.Younger/elder no concept. If a couple has four children then both can claim deduction of tuition fees for any two children each. Even fees of one child can be claimed partly by Husband & partly by wife according to amount paid by each of them .However they should arrange separate receipts for their own parts . Tuition fees is allowed only to the Individual and not allowed to HUF. Tuition fees paid for education of assessee himself is not allowed. Tuition fees can be claimed even if child is Major and/or not depended on person. Tuition fees is allowed on payment basis only not on due Basis. Tuition fees paid in advance is to be allowed in the year of payment. Educational institute must be in situated in India ,so fees paid abroad not allowed. The Education must time "Full time education " , part time courses not allowed . Transport fees ,Hostel fees , Mess charges etc which are not directly associated with education are not allowed under 80C. Frequently asked Questions regarding tuition fees eligibility u/s 80C given hereunder. Que1:Whether Mother can claim the benefit of tuition fees paid for his son/daughter. Ans:Assessee means both mother and father both can take the benefit u/s 80C for amount paid by them respectively. Que 2:If a couple have four children,can they both claim fees for two children each? Ans:Yes ,husband and wife both have a separate limit of two children each ,so they can claim deduction for 2 children each. Ques 3:If a Couple has one child and paid a fees of Rs 300000/-.Can they both claim tuition fees 150000 each ? Ans. :Yes ,they both can claim deduction for 150000 each subject to that they have actually paid same amount .Suppose Husband has paid 2.00 Lac and wife has paid 100000 then husband eligible to claim Rs 200000 but restricted to upper limit of 80C i.e Rs 150000 and wife can claim 100000. Ques 4:Ram has paid tuition fees for his child 20000/- in January 2017 relates to period March to June 2017 ,how much amount he can claim deduction in assessment year 2017-18? Ans: He can claim Full Rs 20000 in assessment year 2017-18 , as this deduction is available on the basis of payment and it may or may not be related to the Financial year in which it has been paid. Ques 5: Whether Late fees on tuition fees is eligible for deduction ? Ans:No,late fees is not eligible for deduction. Ques 6:Whether tuition fees admissible for pre nursery class also? Ques 7:Ram has paid Rs 46000 (Rs 8000 admission fees, Rs 5000 development fees Rs 5000 caution money, Rs 12000 annual charges and Rs 16000 @Rs 2000 per month for March-Oct 2017 Fees) in January 2017. How much deductions in Financial year 2016-17 and 2017-18. Ans:As explained above in the article, "tuition fees" has a wider meaning in income tax as generally perceived ,so in our opinion admission fees Rs 8000 , Rs 12000 annual charges and 16000 fees is covered for claim u/s 80C .Development fees is not allowed and caution money,as it is refundable amount ,hence not allowed.You can claim the tuition fees on payment basis whether relates to this financial year ,old or coming financial year.As amount has been paid in Jan,17 so full amount is allowed in Fy 2016-17. Ques 8:Are there any particular educational courses for which income tax exemption is given? Ans:No specific course defined in the Income tax act ,but course should be in India and a must be a full time course. Ques 9:My Son has been going to Play School Since 01/04/2016. Can I claim the fee paid during the year under Children's Education(80-C). The receipt given by the school shows quarterly fee, & not tuition fee. Ans:You can claim tuition fees paid for playway school.but the break up of the fees should be obtained from the school .Take a certificate from school authorities regarding full year fees on letterhead with their seal. Example is given in question no 10. Ans :You can claim deduction on photocopy of regular payment receipt by Education institution,no need to get consolidated certificate .However if you have lost some of them then collect a certificate from school/college inline with example given below.
" It is certified that ...............son/daughter of .............. is a bonafide student (class:.... Section:..... ) of our school and we have received ..................Rs(in words..........................) in Financial Year 2016-17 as tuition fees." You have mentioned general meaning of capitation fees but from same source (Wikipedia) in the context of Indian law, a capitation fee refers to the collection of payment by educational bodies not advertised in the prospectus of the institution, usually in exchange for admission to the institution. Hope most of the organisations are aware of this. I had claimed the fee paid for my kid's daycare and got the exemption. However, for a safer side, I had attached a copy of the above circular of CBDT along with my tax papers. Sir, pls explain point no.10. As I'm paying school fees for my nephews.Can i claim exemption? Sir can I claim. For hostel fee or mess fee ifor govt b.tech college. Admission fees is allowed or not?? How can I further go ahead with this issue? tuition fees is allowed to parents only. I pay my son's fees and the fee receipt has the following. Request you to kindly let me know what all components can I claim an exception for? As explained all the fees are allowed under this section except which are of the nature of development fund or donation .As schools are using this term differently so no simple identification can be done. However in my view tuition fees , term fees and annual fees is allowed but stationary fess is not allowed.